VampyreBATT WORKING WITH BICKERS ACTION AND THEIR RUSSIAN ARM – Wildtrackers – The remote location specialists. 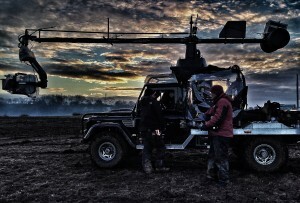 2013 saw the new Camera Tracking vehicle working with Bicker Action as a platform for their Russian Arm. Both BATT and Bickers Action had been approached by a production to film an off road sequence involving tanks on a battlefield in a big Hollywood production being shot in UK. Bickers action got the job and sub contracted Duncan and his vehicle for their Russian Arm which was normally mounted on an Mercedes M Class. It was few days work in the workshop at Bickers Action to fit the arm and all the associated electronics but once on it looked as if the Arm had been made for the VBATT and whats more the whole setup felt extremely stable on the tracking vehicle. We shot on two locations in the south of England in a variety of conditions from hard good surfaces to extremely soft wet and deeply tracked/chewed up mud, but all off road. The VampyreBATT performed flawlessly taking the deep ruts and mud in its stride with over 1 tonne of camera equipment and personnel on the vehicle showing that this really is a multi purpose camera tracking vehicle. The only other tracking vehicle that was working alongside the VBATT in these conditions was on tracks!! !